B*E : What is your favorite part of being a mother of 5? Danyelle : My favorite part of having 5 children is watching my older children interact with their younger siblings. When Oliver (just barely 2) wakes from his nap, the children race to his crib to try to get him out first. They love helping him put on his shoes, find his favorite book and swing in the backyard. There are ten years between my oldest son and my youngest but the bond they share is as fierce as the bond they have with siblings much closer in age. I'm convinced this is because of those little acts of service- given and received. B*E: You have such a zest for life that shines through your blog and the capacity to share everyday pleasures in such a beautiful way -- What turned you on to blogging? As well as what got you excited about crafting in a modern way -- how would you describe your type of crafting? 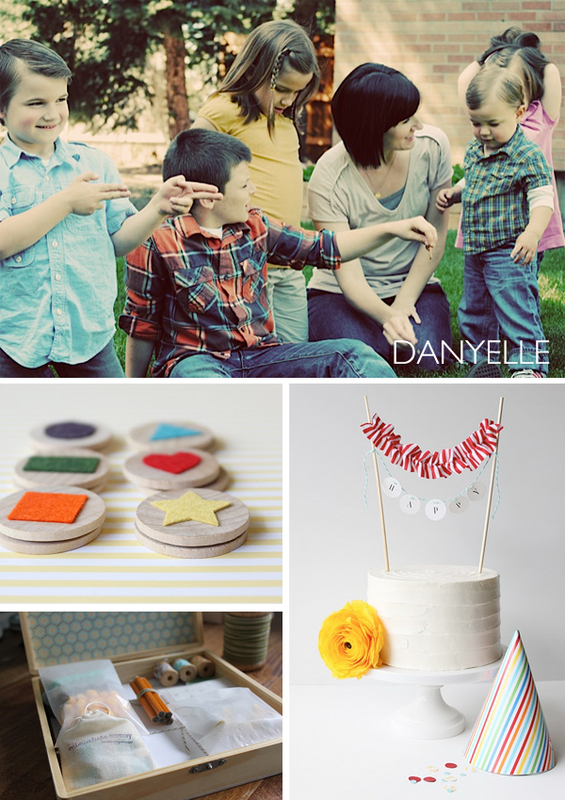 Danyelle: I began reading blogs shortly after having my third child, Owen. Owen went through this stage where he only slept while being held so I read blogs and he slept in my arms. I began blogging myself because I was inspired + entertained by what I was reading and wanted to contribute to such a wonderful community. As far as my crafting style, I guess you could call it "deliberate crafting." I rarely sit down and think to myself, "I feel like making something" without having a game plan. Projects are pondered on for awhile before I ever begin to create them and they're very closely related to what's going on in my life. B*E: What is the funniest thing(s) your kids have done or said that you are still laughing about? Danyelle: My children make me laugh everyday, there really are so many things to choose from! One of the most quoted things came from Owen when he was 3. We were all outside and Owen found himself a lawn chair, a cup of water and sat down and declared "This is the lifetime!" Whenever my husband or I are feeling especially content we follow Owen's example and repeat his sweet words, "This is the lifetime!" It will forever bring a smile to my face. B*E: What is your daily schedule/routine like and how does blogging and crafting fit into that while being a mother? B*E: How do you find or at least seek after balance? What keeps you centered? Danyelle: For me, staying balanced means keeping my passion/need to create and my responsibilities as a wife and mother in check. If I neglect one, I feel I'm neglecting myself and my potential. My faith and all it encompasses reminds me of that potential and keeps me the most centered. In addition to that, I've been carving out time to write in a personal journal. Not on a computer or an iPad, but an actual pen and notebook. Most days it's just simple thoughts or impressions, a line from a book or song that stuck with me, or a quote I happened upon. The few minutes I spend a day with that notebook have done wonders for my sense of clarity. B*E: What qualities in your own mother or women around you do you admire most? Danyelle: For as long as I can remember my mother has gone out of her way to make those around her feel special and loved. Everyday I think of her example of selfless service and strive to do the same. I'm a big fan of Danyelle's and it was nice to see her here as well. Love this quote and what she has to say about her family. So sweet. Going to hop on over to her blog right now - thanks for introducing me!! Thanks for featuring Danyelle. Her blog is one of my favorites! Danyelle writes one of my favorite blogs. It's so pretty and serene. I loved seeing more of her here. Thank you! danyelle is truly talented and has so many admirable qualities. thanks for interviewing her, rachel! Patience is a virtue. It's a fruit of your determination. hi rachel! this is a nice interview! Danyelle's likability shines through here! No wonder why you chose to feature her! Thank you!